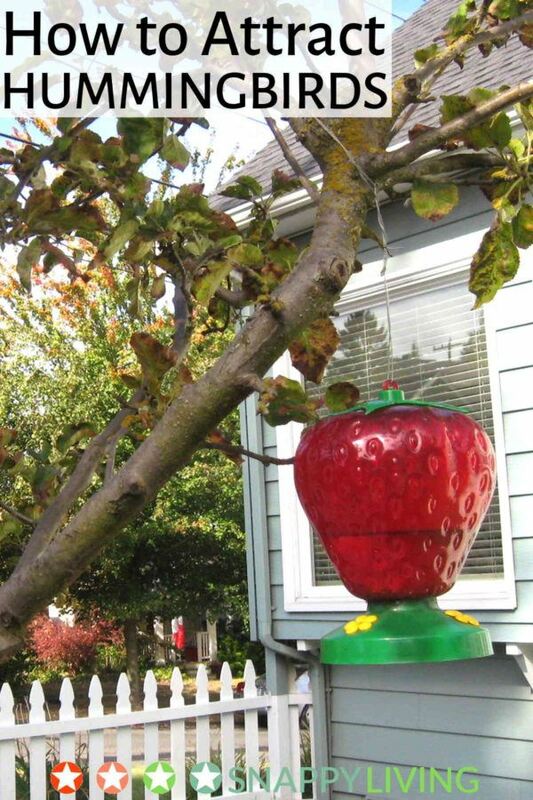 You’ve bought a hummingbird feeder or made one yourself. You’ve put it in a nice spot in your yard where you can enjoy watching the hummingbirds from a window. There’s just one thing missing from this idyllic scene: the hummingbirds. Turns out this is not a case of “If you build it, they will come.” Here are some tips on how to attract hummingbirds. Birds are very visual creatures, especially when it comes to color. They locate food by looking for certain colors. Hummingbirds burn such an astonishing amount of calories every day that they actually enter a state of hibernation every night instead of sleeping, just to conserve energy. They can’t waste their energy looking around for food. They have to get a visual that makes them absolutely sure a good source of food is available, and then they’ll come check out what you’ve got for them. Make sure they can see your feeder. Tie red ribbons (their favorite color) to the hummingbird feeder. Make the ribbons a couple of feet long so their blowing movement in the breeze will be visible to hummingbirds from a distance. That’s the first step to draw them in and get them checking out what’s on offer. Plant flowers they like. Surround the feeder with colorful trumpet-shaped tubular flowers like honeysuckle. Plant a variety of flowers so you have blooms all year long and a variety of stuff for the hummingbirds to eat. (There are many types of flowers hummingbirds like.) Choose wildflowers over hybrids because they produce more nectar. Provide a bath. Birds need to bathe regularly, so post a bird bath near your feeder. Hummingbirds gravitate toward moving water, so consider getting a bath that has a fountain, or setting up some kind of misting station. Don’t crowd them. Birds are very cautious, but they can learn that you mean them no harm. Don’t get too close too fast. Move slowly and be as still as possible. After a while, they’ll get more relaxed in your presence as they realize you’re not there to prey on them. Your hummingbird haven needs sun and shade. An ideal spot would be near a tree or overhanging eave that gets some sun during the day. That gives hummingbirds a chance to enjoy both sun and shade. Ensure your feeder is only for hummingbirds. Bees and ants also like nectar. Some feeders are designed better than others when it comes to allowing hummingbirds only to get to the nectar. Change your nectar and clean your feeder at least twice a week, and more like every two days in hot weather. The rule of thumb is: if you wouldn’t consider drinking from the feeder yourself, the birds won’t either. Birds can see dirt, mold and floating debris better than you can, and those things will signal them that your nectar is tainted. Some people believe you need to be careful when you leave the feeder up, or the birds will stick around instead of migrating. This is a myth: their migration instincts react to the length of the day and position of the sun. You should leave the feeder up until three weeks after your last hummingbird sighting of the season. Adult males migrate weeks before females and hatchlings, so if you take down the feeder in the mistaken belief you’re encouraging the last birds to move on already, you may actually be denying them the food they’ve come to rely on. If you deliberately attract an animal to your home, you have some responsibility to protect them. While accidents happen and you can’t necessarily predict a hawk swooping in to eat your guest, consider how to make your area a reasonably safe place for a hummingbird to be. Is there a neighborhood cat that runs loose in your yard? You’ll need to find a way to keep it out. Crows and squirrels will eat their eggs, so if you have an abundance of those animals competing for food at your home, it might not be the best place to attract hummingbirds. Hummingbirds will fight over food. This is natural behavior. If you see a war commencing at your feeder, the best option is to put up a second feeder at least ten yards away and out of sight of the original feeder. Some of the birds will move to it and that will reduce the fighting. Don’t interfere with the fighting. It’s a survival behavior, so don’t attempt to “punish” the birds who engage in it, or you might confuse them into not being aggressive in other situations where it’s a matter of life and death.